Age of patient: 46 y.o. Figure 1: Bite-wing projection, right side. Tooth no. 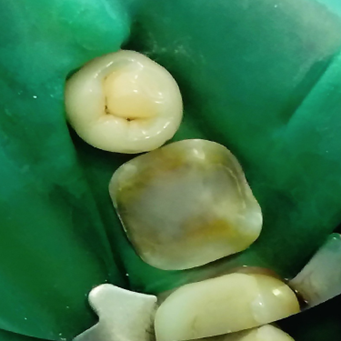 46 was assessed as the biggest problem due to a large carious lesion in dentine, close to a vital pulp, and severe loss of crown structure, together with old restorations. Patient refused to have the PFM crown changed as, she stated, it did not cause any problems. 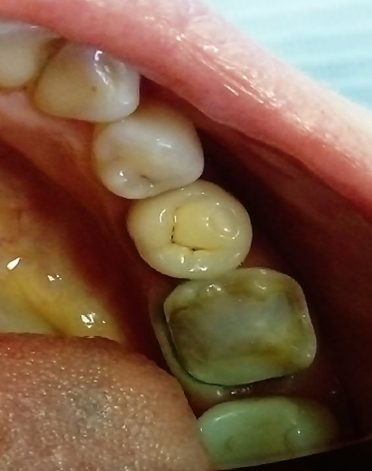 Caries removal and removal of all restorations was done under rubber dam insulation under local anaesthesia. After all infected dentine and unsupported enamel was removed there were very few structures left for direct restoration, so a decision was made to restore the tooth with onlay using MyCrown. First, margin relocation on distal margin was done using composite material because gingival margin was placed subgingivally. 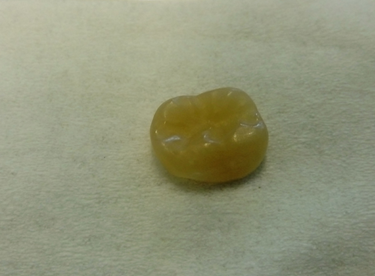 Then, we did Immediate Dentine Sealing (IDS) using the same composite material. Figure 2: Tooth 46 after onlay preparation with retraction cord placed. Administration of the case in MyCrown was done by an assistant. Prior to scanning we secured a dry working field by placing an OptraGate Dry Tip on the parotid, coupled with suction. After scanning the area of restoration, we scanned the opposite jaw, and finally performed a buccal scan to register the occlusion. Digital models were created and the software correlated them according to bite registration. 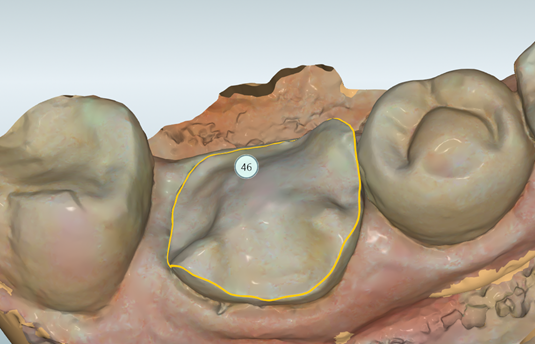 Figure 3: Margin of preparation, as shown on a digital model, in MyCrown Design. 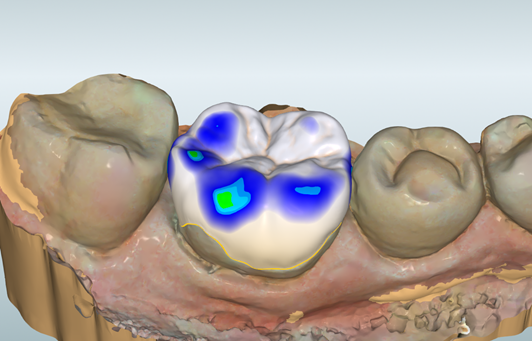 Figure 4: Design proposal, colours on occlusal side indicate strength of contact with antagonists. Figure 5: Onlay after polishing. Figure 6: Tooth 46 prior to adhesive cementation of the onlay. 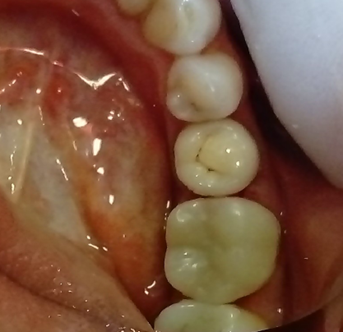 This clinical case shows how we can deal with severe loss of dental structure and reconstruct a crown in one visit using modern technology. 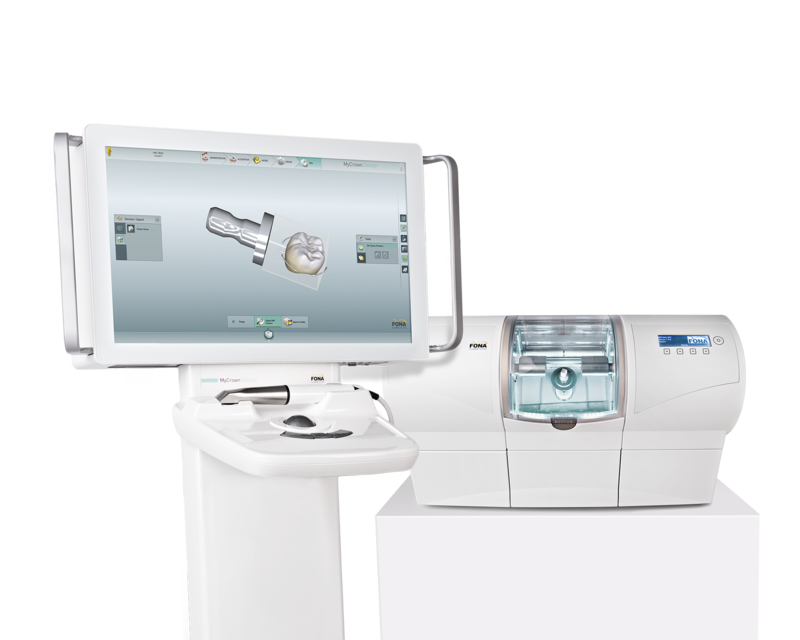 Chairside CAD/CAM can help to solve more complex cases quickly and effectively, so that both the dentist and patient are happy with the result. 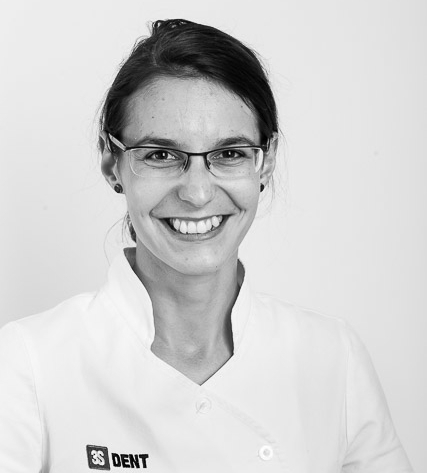 General dentist, working in private clinic 3S DENT based in Bratislava since Graduation. Interested in Prosthodontics and Esthetic dentistry. Graduated at Palacky University in Olomouc, Czech Republic in 2011.